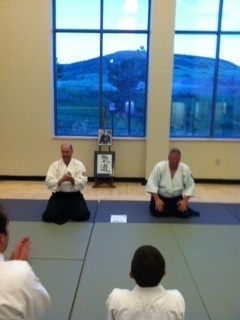 The three Kiryu Aikido students who tested in April recently received their certificates from Hombu Dojo in Japan. In a fortunate alignment of scheduling, Blevins Sensei was in town to teach that weekend and was able to personally give the certificates to Bob-san for his Ikkyu test and Greg-san for his Sankyu test. 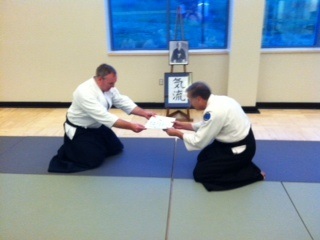 Blevins Sensei presents Bob-san with his Ikkyu certificate. Greg-san receives his Sankyu certificate from Blevins Sensei. The following weekend, Dave-san received his Gokyu certificate from Senior Instructor Les Steveson. 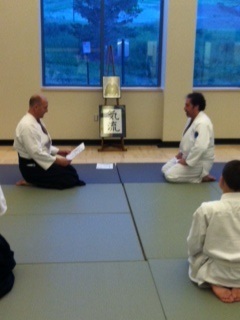 In addition, Charles-san was recognized for attaining 500 hours of practice. 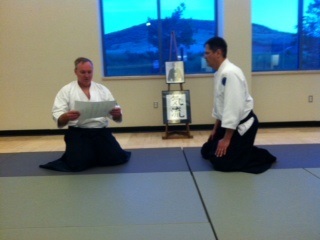 Dave-san receives his Goyku certificate. Charles-san reaches practice milestone of 500 hours. New student Justin-san recently tested for his 6th kyu rank a few weeks ago — that first big step in an Aikido journey — and we welcomed three great new students to the dojo this spring. You’re all great examples of the results that happen with dedication and commitment to practice. Omedetou gozaimashita, everyone. Keep up the hard work and focus! Nice job Charles-san and Dave-san. Well deserved.